BLESSTHEFALL Graces the Cover of Outburn Magazine Issue #61 – On Newsstands Now! Fearless Friends Tour 2011 headliners blessthefall are pleased to announce that their new album, Awakening, debuts at #31 on the Billboard Top 200 charts! This number marks the band’s highest chart position ever and highest level of sales in their career. Awakening is also #1 album of the week at Hot Topic and charted at #3 on the Top Hard Music chart. 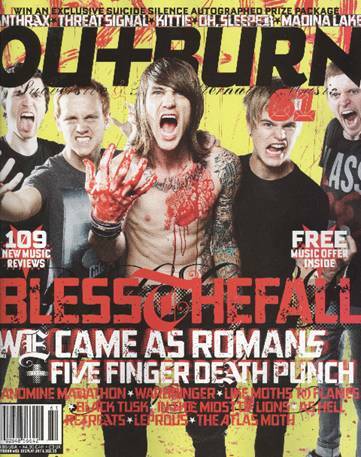 Fans can check out what’s going on with blessthefall by picking up the newest issue of Outburn Magazine (#61). blessthefall graces this issue with an in-depth interview and striking photos taken by widely-recognized entertainment photographer Jeremy Saffer. The issue is on newsstands now, so make sure to grab your copy before they are sold out! FEARLESS RECORDS recently announced the full line-up for The Fearless Friends Tour 2011, which includes headliners blessthefall and supporting acts The Word Alive, Motionless In White, Tonight Alive, and Chunk! No, Captain Chunk! The tour is presented by Peter Says Denim, and is sponsored by Converse, Good Fight Entertainment, MerchNow, Tilly’s and WHOOZNXT. The tour is set to blaze through North America this November / December, and a current listing of tour dates can be viewed below! Tickets are available now. This entry was posted on October 14, 2011 at 9:41 am and is filed under Artist Watch, News with tags Awakening, BLESSTHEFALL, Fearless Friends Tour, Outburn Magazine, The Rock Tribune, TheRockTribune.com. You can follow any responses to this entry through the RSS 2.0 feed. You can leave a response, or trackback from your own site.